The latest OSes are really cool! I can use different devices more productively. Thank UncleSchnitty for his great work – OS X Continuity Activation Tool! My mid-2011 MacBook Air can now AirDrop and Instant Hotspot with iDevices! With the new AirDrop, files can be transmitted quickly, directly and wirelessly between iDevices and Mac. I find myself use iPhone to capture more videos, then send them to Mac for editing and uploading to Vimeo. I make more video! Convenience drives usage! Here is a video of my last Sunday hockey game. I read a lot of PDF-based user-guides, white papers and magazines. I used to copy PDF on my laptop to Dropbox, wait till the file is completely uploaded, then read the file on iDevices. Three steps. A lot of duplicated files in Dropbox. Now I Air Drop a PDF to iPad, open it with PDF PROvider. Two steps only because it is fast. Once I read the document I will remove if from iPad. Less file management. I use Eddy to stream non-frequently listen audio files stored on Dropbox to iPhone. Similar workflow as PDF. Now I can Air Drop a mp3 file to iPhone and use OPlayer Lite to listen to it. Quick! Wireless! Convenient! AirDrop and Instant Hotspot keep iPhone’s Bluetooth always on. Bluetooh drives iBeacon adoption! Beside Speak Screen, Screen Recording, Air Drop and Instant Hotspot, iOS Notification Center (NC) is my most favorite new feature. 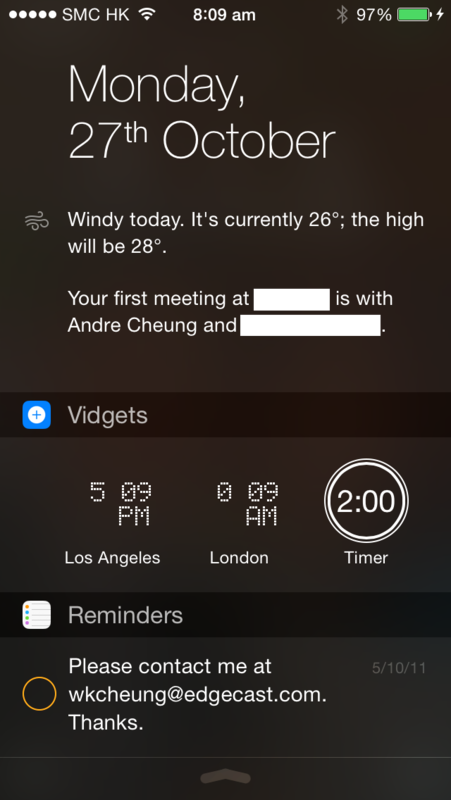 Vidgets is a small (13.3MB), free and great iOS app! It shows customizable info about times, network, memory/storage usage, GPS and weather. All in one swipe down! Quick! Convenient! Recently I walk more. I walk more if I find the number of steps I walk is small. Awareness drives behavior change! All these software widgets make the world more beautiful! Let’s talk hardware gadgets next time. Wish you have a great day! iOS 8 turns iPhone into a super audiobook! 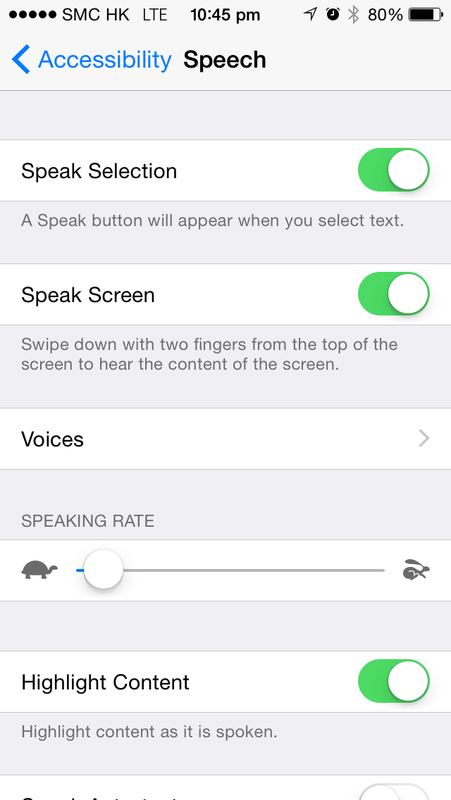 The new Speak Screen feature of iOS 8 empowers iPhone to read the contents of the screen to you. Swipe down from the top of the screen with two fingers, or ask Siri to “speak screen”. Speak Screen works for Apple apps such as Safari and iBooks, as well as third parties apps such as Kindle! How to enable Speak Screen? Long answer: 9to5Mac’s How-to: Have your iOS device read text for you. Yosemite turns your Mac into a super training video composer! The above video is recorded by connect my iPhone 5S to my MacBook Air via lightning cable. Then use QuickTime Player to capture what shown on the iPhone screen. ‘Record Your iDevice’s Screen” is one of Wired’s top 10 Yosemite features. It is very easy! A picture is worth a thousand words. Video is much more! I hope you enjoy this fast (written), short (in length) and rich (in experience) blog post!